Kids love to listen to stories aloud. After 1st grade, they're ready for longer, more complex stories. I love the fact that this means in our car rides, I get to listen to more interesting stories! This also gives kids a chance to listen to stories that are more complex than they can read. I firmly believe that listening to longer stories improves their independent reading because it helps kids develop a story in their mind, picturing the characters, linking the events together, feeling empathy with a character. As their reading fluency develops, they'll bring this love of stories to their independent reading. Here are four fun audiobooks - the best part is that they're available FOR FREE! Look for them at NetLibrary.com - a free subscription online is available through your local library. Look on your local library's website, and follow the links for online resources. For more information, see my earlier post. The Ballad of Lucy Whipple, by Karen Cushman, tells the story of a young girl who travels to California during the Gold Rush with her mother & siblings. Their home is now the rough town of Lucky Diggins. Her mother now runs the boarding house (it’s really just a large canvas tent) in the mining town. I loved how you heard Lucy’s voice through the audiotape, and really felt what it was like to live in this Gold Rush town. Silverwing, by Kenneth Oppel – perfect animal adventure for lovers of the Warriors series. When a newborn bat called Shade gets separated from his colony during migration, he goes through many different adventures, fighting off different adversaries: city pigeons, a kingdom of rats, and two vampire bats. The Westing Game, by Ellen Raskin - is a Newberry Award-winning mystery much in the tradition of Agatha Christie and the game Clue. One day, sixteen people are called together to hear the reading of Samuel Westing's will. They are challenged to solve a mystery, find a murder, and inherit a fortune. Anastasia Krupnik, by Lois Lowry, is a fun story about a spunky girl growing up. Anastasia, in 5th grade, just hears the news that her parents are expecting a new baby. She is definitely not thrilled at this news. Throughout the story, she keeps a list of "Things I Love" and "Things I Hate". It is definitely set in the 70's, so I found it fun to listen to with my daughter. It also has some very touching moments about Anastasia's relationship with her elderly grandmother, trying to understand someone who's slipping away. Young kids, about ages 4 - 7, love listening to stories again and again. Below I'm listing some great choices that are available (FOR FREE!) through NetLibrary.com (see previous post) and your local public library. Clementine, by Sara Pennypacker, is a funny tale of a 3rd grade girl who reminds me of Junie B. Jones and Ramona the Pest. Clementine has such spirit - she just keeps going, even though she's having a bad week. O.K., fine, a really bad week. Her friend Maragaret got glue stuck in her hair and cut part of it off. So Clementine helped her even it up, and cut off all of Margaret's long shiny hair. And everyone blamed Clementine for it. Jake Drake - Know-it-all and Jake Drake - Bully Buster, by Andrew Clements, are two fun school stories with a lot of heart. Zelda & Ivy, by Laura McGee Kvansnosky, is a longer picture book about two fox sisters in a classic older sister / younger sister relationship. It's broken into 3 chapters which are really separate stories, so it's easier for young kids to follow along. Are you planning a long drive soon? Consider getting an audiobook for the whole family to listen to in the car. Free audiobooks! Download audiobooks to your computer for free! You can get a free (yes, FREE!) membership to Netlibrary.com through your local public library. On the Oakland & Berkeley public library websites, look for "online resources". Follow the links to e-audiobooks - that will take you to Netlibrary's site and give you a free membership - just enter your library card number (and pin number in Oakland). Follow the links below. Through Netlibrary.com, you can download and "checkout" MP3 files for three weeks. You must open the files with Windows Media Player to activate the subscription. You can then transfer the files to your MP3 player, or just listen to them on the computer. These files do not work with iPods because of the Digital Rights Management. Instead, I use an MP3 player. If you have an iPod, you can purchase audiobooks through iTunes or Audible.com. The new iTunes software update has great features for audiobooks, like bookmarking. I love finding books that just capture the imagination of certain kids. These two books just capture what it's like to be a boy in kindergarten - playing with toys as they come to life to do heroic battle and rescue the situation at hand. Traction Man Is Here! by Mini Grey tells the story of a little boy's heroic toy action figure and all of his valiant deeds. Traction Man zooms down to save the farm animals being held captive by the evil pillows. He jumps on the pillows, wearing his rocket boots and saves the day. The little boy (nameless throughout) brings Traction Man with him everywhere, so Traction Man helps with the dishes - becoming a deep sea diver and searching for the lost sieve in the depths of the sink. I just loved the feeling of celebrating a little boy's imagination and love for action and adventure. 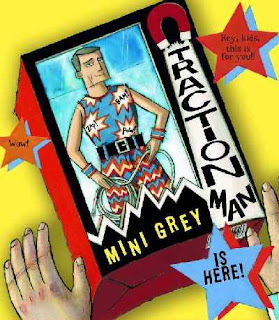 There's also a sequel: Traction Man Meets Turbo Dog, published in 2008. 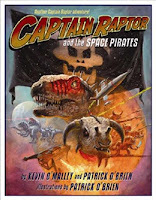 Captain Raptor and the Space Pirates, by Kevin O'Malley and Patrick O'Brien, reminds me of little boys who make their dinosaurs into real characters. This story takes place on the planet Jurassica, which is under siege by the evil space pirates. They capture the famous jewels of Jurassica, and Captain Raptor must save the day! If you have a dinosaur lover, this tale is for you. But it isn't for the faint of heart - the images are full of missiles, weapons and space battles. Think of Star Wars, but where the heros are all dinosaurs dressed in full battle gear. I'm guessing that 1st and 2nd graders would love it, but younger kids might eat it up as well. You just have to judge each kid. If you like this book, check out the first in the series: Captain Raptor and the Moon Mystery (2005). Henry's father used to say, "If you build your house far enough away from Trouble, then Trouble won't find you." But Henry discovers that, no matter how hard you might try, you can never build your house far away from Trouble. Trouble will always find you. What counts is having good people near you when Trouble comes your way. Trouble, by Gary Schmidt, is an intense, well-written story. The book begins with 7th-grader, Henry, wrestling with his relationship with his overpowering, almost bullying, older brother Franklin. But suddenly, quite in the beginning of the book, Franklin is hit while out running. Henry's family withdraws - each family member isolated in their own grief, but Henry throws himself first into his crew racing, and then into his goal of climbing Mt. Kitaden. 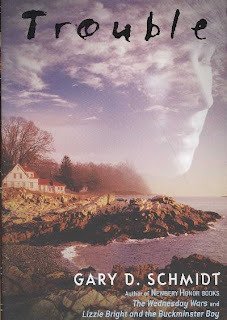 He has to deal with the racial tensions in this small New England setting - head-on, since Chay Chouan, the boy who killed his brother, is the one who picks him up as Henry hitchhikes to Kitaden. This is an intense story, well-written and very descriptive. I was definitely hooked through the reading, but I'm not sure the best audience for it - I'm thinking maybe 8th grade and up. It would actually be fascinating to delve into the story and think about the reactions of the different characters. But I'm not sure kids would get into it as just pleasure reading. It would almost work for an adult book group - but then, I love young adult novels. It's a fascinating time of life - when we are thinking through so much of the world, who we are, and what is important to us. New York : Simon & Schuster Books for Young Readers, c1996. [New York] : Joanna Cotler Books, c2002. New York : Farrar, Straus, Giroux, 1980. 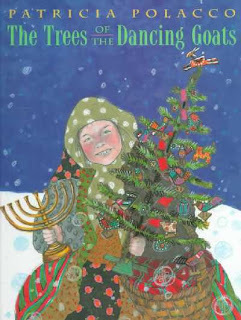 The Trees of the Dancing Goats, by Patricia Polacco, is a wonderful holiday story about Patricia Polacco's childhood, and the year that all her neighbors came down with Scarlet Fever. 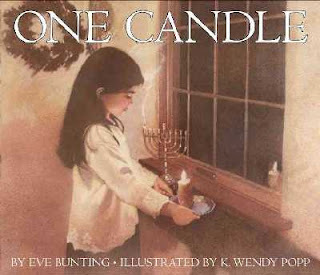 The young narrator's family celebrates Hanukkah, following her Russian grandparents' traditions. But when they realize that their neighbors won't be able to celebrate Christmas because they are so sick, they cut down many small Christmas trees, decorate them and bring them to their neighbors' houses. It's a lovely tale of friendship, sharing and community. 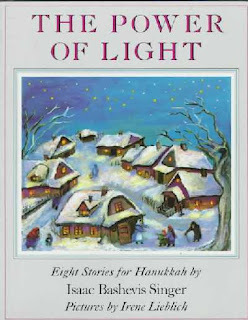 The Power of Light, by Isaac Basheivis Singer, is a collection of eight stories for Hanukkah. I especially love the title story in this collection, "The Power of Light". It tells the story of a teenage girl and boy who are caught in the Warsaw Ghetto, hiding in a bombed basement. David forays out and brings back a bit of food and a light for Hanukkah. This gives Rebecca the courage to escape with David to the forests and the partisans who will help them. My favorite line is, "That glimmer of light awakened in us a hope and strength we didn't know we possessed." 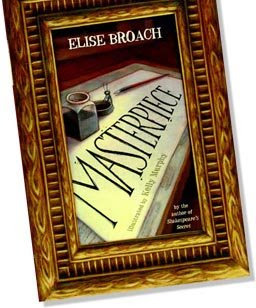 I'm just finishing Masterpiece, by Elise Broach, and I'm really enjoying it. Above all, it's a story of friendship - an unlikely friendship between Marvin, a small beetle, and James, a 10-year-old boy living in New York City. But layered into this story is an adventure and a mystery. It all starts when James is given a pen-and-ink set for his 10th birthday. Marvin is exploring in James' room that night, leaving James a special Buffalo Nickel for his birthday, and he discovers the ink. Marvin, it turns out, has a remarkable gift for drawing - he dips his forearms into the ink and draws a miniature version of the scene outside the window. James finds the drawing and meets Marvin, and their friendship (and adventures) develop from there. They get swept up into helping arrest an art thief at the Metropolitan Museum of Art. It's a fun read - with both funny and touching moments - perfect for kids ages 8 - 10.